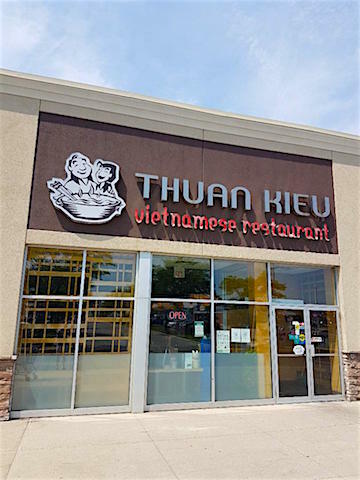 Having just moved back to London, ON, after many years away, I was exploring my new neighbourhood when I stumbled across Thuan Kieu at Northland Mall. It seems it's been there for more than 20 years, but since I was away from London for almost that length of time, it was new to me. I decided to go in for an early lunch -- this was at 11:30AM on a recent Thursday -- and I was glad I did. The food was good and it brought back fond memories of my time in Vietnam in the early 2000s. 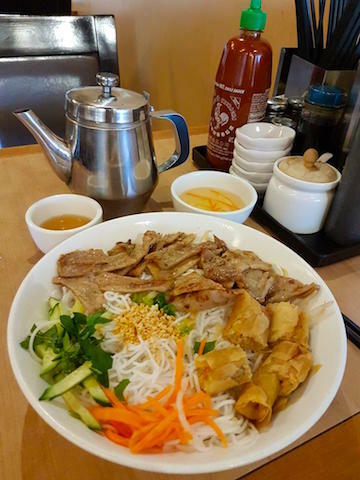 Menu: The menu covers nearly all the greatest hits of Vietnamese cuisine, including rice dishes, vermicelli dishes, and noodle soup dishes (pho). There is also a section of Thai and Chinese favourites. The only thing that's missing is crepe dishes (banh xeo). 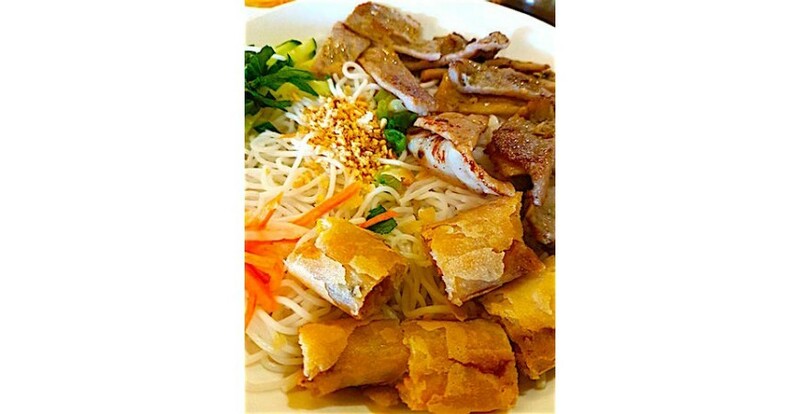 I selected a dish from the vermicelli bowl section, bun cha gio xa thit nuong, which is pictured below. It's lemongrass pork and chopped spring roll on a bed of vermicelli mixed with fresh vegetables. If memory serves, it was $10.50. There are several other variations of this dish on the menu, all starting with 'bun cha gio.' 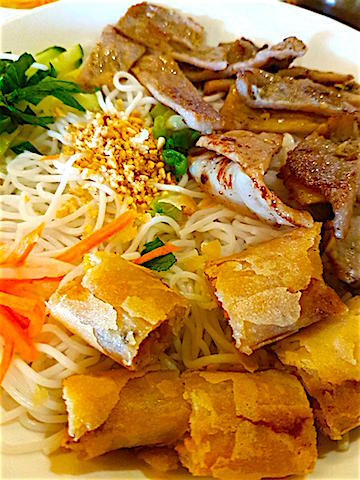 The essential elements of bun cha gio are the vermicelli, vegetables, and spring roll. Note the sauce at top right. It goes into the bowl to be mixed with the vermicelli. I put the whole bowl in, but I think half would have sufficed. The whole bowl made it too sweet. 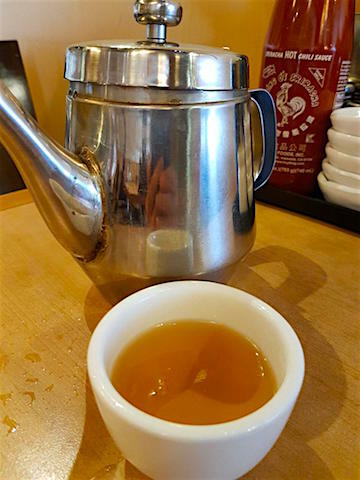 Beverages: As soon as I sat down, a teapot appeared. It turned out to be bottomless. On another visit 2 days later, I ordered a Tiger beer, which I hadn't had in years. It was appropriately chilled and went down well. I think it was $5.95/bottle. There was also Tsingtao, and several others. I noticed Vietnamese iced coffee, which I'd like to try on a future visit. Service: Service was excellent at my lunchtime visit. At my dinnertime visit, which was on a Saturday night, the place was very busy and a couple of requests got lost in the hustle. They were eventually handled by a different server a quarter hour later. No biggie. Ambiance: Relaxed and casual. The decor is mainly wood and neutral tones. 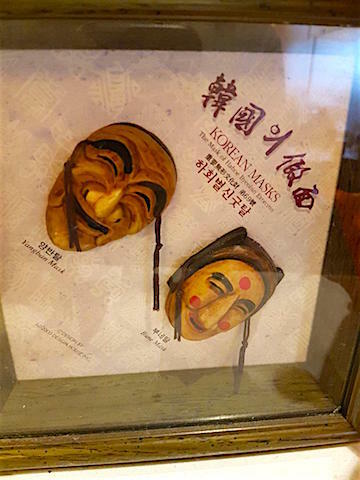 A Guan Yu shrine presides over the establishment and there are a few items of pan-Asian decor at the back counter, including some Korean masks (see below). Presumably they were a gift from customers? Recommendation: Go! To judge by the crowd on the Saturday, it might be worth making a reservation on weekends. Macau is one of my favourite places in East Asia to eat. Read on to find out why! L&P samples the food at Hong Ping Restaurant in London, ON, and gives it the thumbs up. L&P reviews La Villa boutique hotel in Battambang, Cambodia.